When I was a boy I adopted a pet T. Rex. He was about six feet tall as a baby, scaly, green, and had teeth like roofing nails. I called him Buster because, I don’t know, he looked like a Buster. My sister crocheted him a red collar and also matching red slippers, but they didn’t quite fit. The mittens came out well though, they fit his stubby forelimbs perfectly and were quite fetching. I took Buster for long walks around the neighborhood and even up to Pine Grove Park, where Buster loved stomping through the bleachers at baseball games and gobbling up lap dogs. 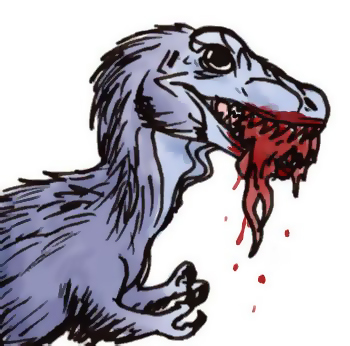 Sometimes it got a little out of hand, but T. Rexes will be T. Rexes. On cool autumn nights Buster and I would sit in the backyard, playing canasta and sipping iced tea. Well, truth be told, I would sip, and Buster would just dump drink after drink onto his chest. Those puppet arms of his were not meant for gripping highball glasses. Buster was a killer canasta player though. Things were wonderful and we even had our own language. I would say, “Hi, Buster! How are you doing, boy?” He would shriek at me in response, and the sonic boom would break all the windows in a three block radius and knock squirrels out of trees. Once in a while there would be the odd rampage, like when Buster barreled through the nursing home, but since the old people didn’t move too well only a few lost their lives. This is not how you would think it would work out—you’d think slow would get your head crunched like a gumball—but a T. Rex will go batshit crazy at rapid movement. 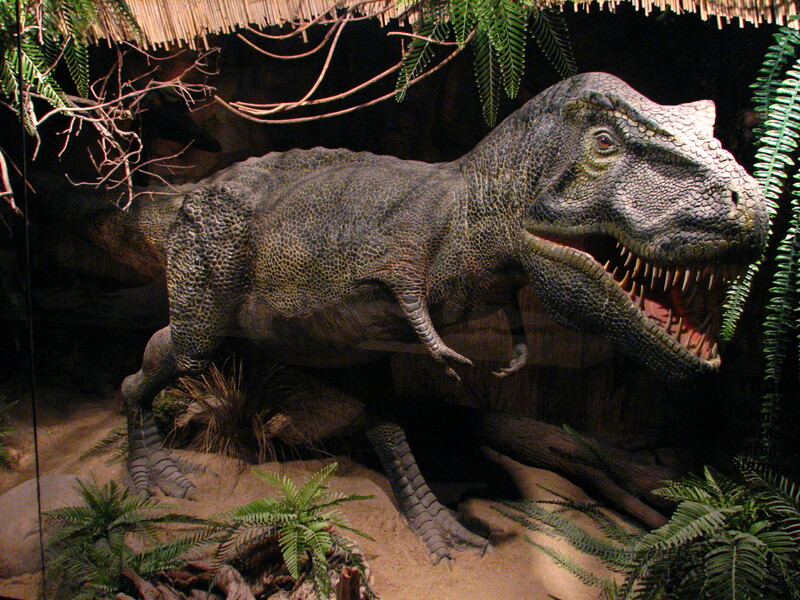 Skipping, hopping, or darting children make a T. Rex light up like a slot machine. Especially when the children are overstimulated and flapping their arms all around their heads like they do. So if you happened to lose your dementia-wilted aunt at the nursing home last week, well just count your lucky stars it wasn’t your six year-old daughter and all her arm-flapping friends. Buster was loyal to me and a bit overprotective, we lost five mail carriers because of this. I know, I know—there’s a repetitive theme here. But you have to understand that most of what you’re trying to do as the guardian of a T. Rex is to steer him away from your friends, acquaintances, neighbors, loved ones, complete strangers, and anything or anyone with flesh that’s in his eyesight. Besides rending and chomping flesh, Buster also loved playing Storm the Castle—Buster was very good at this, and if you ever get your own T. Rex I would recommend that you not play this game with your own family’s house. Try painting a large refrigerator box like a castle, or just use your local Social Security office. As far as reading, we had a short phase where I got Buster into Hemingway and knock-knock jokes printed on Dixie cups, but he wouldn’t touch Proust. Buster definitely had a thing for Burt Reynolds movies. His favorite was Sharky’s Machine, and he clapped his forelimbs when the bad guy fell off the building at the end—well, when the dummy fell off the building. It was just so obviously a dummy—but Buster didn’t care. Unfortunately we lost my stepmother to Buster when she tried to ground me that one time when Buster and I went drinking and I puked all over the car. Buster puked all over the car, too. Matter of fact, he filled the car with his vomit. Then he puked all over me, then all over my mother. Anyway, the day Buster coughed up my stepmother’s femur bones is the day my relationship with my father started looking up. A message was imparted there, if you know what I mean. We had some great parties after that and Dad was more than accommodating if our beer supply needed replenishing or when my buddy Freddy Longlegs needed Dad to run the odd errand down at the crack house. FYI, it’s best to keep a drunk T. Rex away from power lines, bridges, and pre-schoolers—pre-schoolers are like popcorn to a T. Rex. Especially if they’re moving fast. Sorry about your daughter and her nine friends. Ten with the teacher. But as college approached for me I knew my life with Buster would have to change. For one thing, he had grown to over forty feet tall, weighed seven tons, and the Army was on our front lawn trying to stop him. I was told the commanding general was a descendant of Patton. Buster ate him and went through half a brigade—what stopped him was all those helmets, they were hard to get down and gave him bad gas. I loved that little T. Rex and I’m really terrible at goodbyes. Thankfully I didn’t have to say goodbye, because he followed me all the way to the University of Iowa. 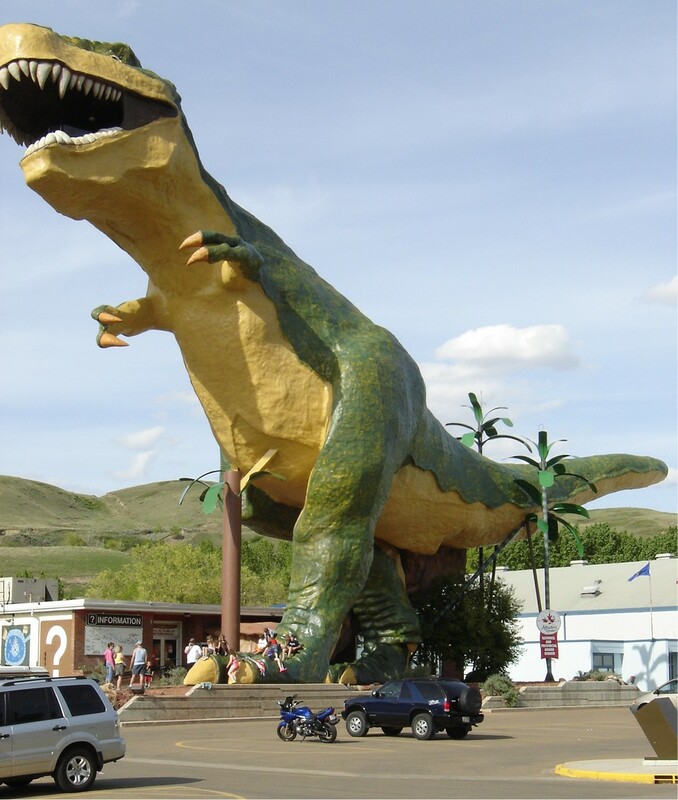 I was glad to see him, of course, but I had no idea a T. Rex had that good a sense of direction. He ate the dean, the President, and about half of my advanced writing class—the insufferable half, thank God. I don’t know how long I have with ol’ Buster—our time with our pets is always too short—and I’m hearing army helicopters circling the house even now. But just so you know, I’ll put up a T. Rex with any pet. Dog, cat, hamster, anteater—bring ’em on. Buster beats them all for loyalty. And friendship. I’ll concede cuddling—Buster and I tried that once, and I broke my neck in two places—but I bet your dog can’t swipe helicopters out of the sky.